Funnel charts are composed of a single set of numbers. If your dataset includes multiple columns, the funnel chart will use the values found in the first column. If you want to chart a different set of values, rearrange the order of your columns. Options for labeling the left and right axes. 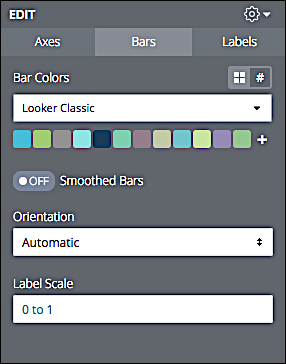 Configuration options for the value bars. Automatic. Customer Insights examines table rows and columns, and draws the chart based on which entity (rows or columns) contains the most data points. Data in Rows. The data comes from table rows. Data in Columns. The data comes from table columns. Configuration options for value labels. Left. Data labels are displayed on the left side of the chart. Inline. 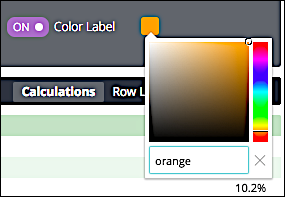 Data labels are displayed on the chart bars. Right. Data labels are displayed on the right side of the chart. Hidden. Data labels are not displayed. % of maximum value. The percentage is calculated by comparing the bar value to the largest value in the chart. % of prior row. The percentage is calculated by comparing the bar’s value to the value of the previous bar. Left. Percentages are displayed on the left side of the chart. Inline. Percentages are displayed on the chart bars. Right. Percentages are displayed on the right side of the chart. Hidden. Percentages are not displayed. Left. Values are displayed on the left side of the chart. Inline. Values are displayed on the chart bars. Right. Values are displayed on the right side of the chart. Hidden. 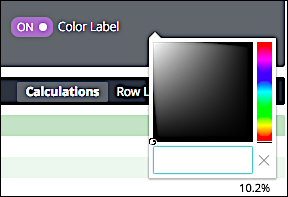 Values labels are not displayed.